This time, we are talking to Debbie at Coach Debbie Runs! I am super excited about this one because it is all about finding love thru running and blogging! So, this isn't exactly a story about a blogging bestie. It's her husband, who definitely doesn't blog. They did meet at a race though. Almost 20 years ago, in fact, Debbie was at a race called the Tram Road Race, which is billed as the world's toughest 6k. It starts up the road to the Palm Springs Aerial Tramway, and basically runs 3.7 miles straight up to the finish line. They actually met when they both found themselves on opposite sides of the finishing area, cheering on the runners who were still finishing up. It's a brutal race, and the last half mile is the worst, about a 20% grade, so runners can use all the encouragement they can get. After the race, there was a pancake breakfast at a local park. Debbie was standing with a mutual friend, when her future husband Alan came up to her and (sly line) asked if they were sisters. She introduced them. During the award ceremonies, they raffled off prizes, and Alan happened to win dinner for two at a local restaurant. The next day (which happened to be Easter), he called Debbie and asked her to dinner the following Tuesday. They have basically been together ever since. It was because of her husband that Debbie ran her first marathon. He had run about 30 marathons (he was pretty fast back then, had a couple sub-3 hour races), and he had been running the Honolulu Marathon with Team in Training for several years. He always raised so much money for them that they allowed him to bring Debbie along. 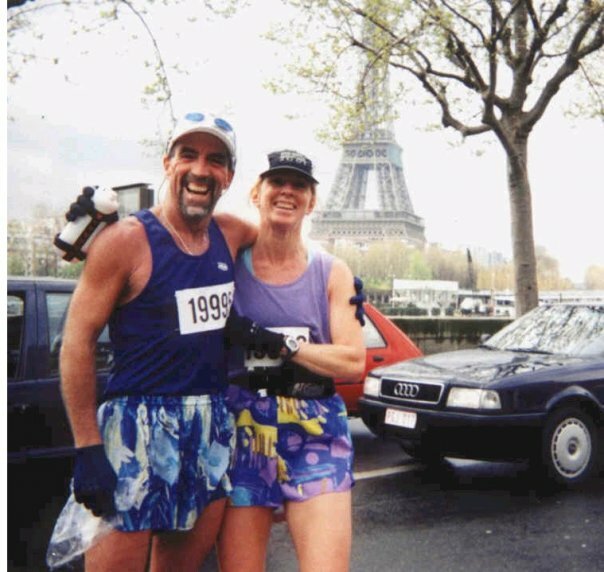 Since then, Debbie has run 36 marathons, he's run another 36 or so, plus an ironman. They run regularly together. Three years after Alan and Debbie met, they decided to get married. They wanted to do something fun and different, so they looked into a couple running options. That year they had a race over the Coronado Bridge, usually called Do the Bridge. That year they called it Say I Do on the Bridge, but when they looked into it, it cost $1000 for a ceremony that actually would take place at a park after the race. It didn't seem worth it, so they talked to a friend of theirs who is the race director for the Tram Road Race. They ended up sending their minister and family to the finish line before the race, then they ran it together, Debbie in her white satin running shorts and lace running bra. 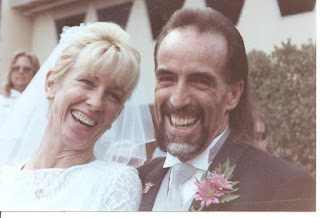 After they finished, they cleaned up (she had two of each item), she added a veil, lace t-shirt, and Alan wore black and white running shorts and a tuxedo jacket, and they said their I-dos right on the finish line. For years they had strangers come up to them and say, "I was at your wedding!" The only downside was that somehow they ended up committed to running the race every year near their anniversary. (Here's the link to the story on Debbie's blog. http://coachdebbieruns.com/2014/10/22/top-local-news-our-anniversary/) Check out their story on the local news too! Wasn't this a fun story? 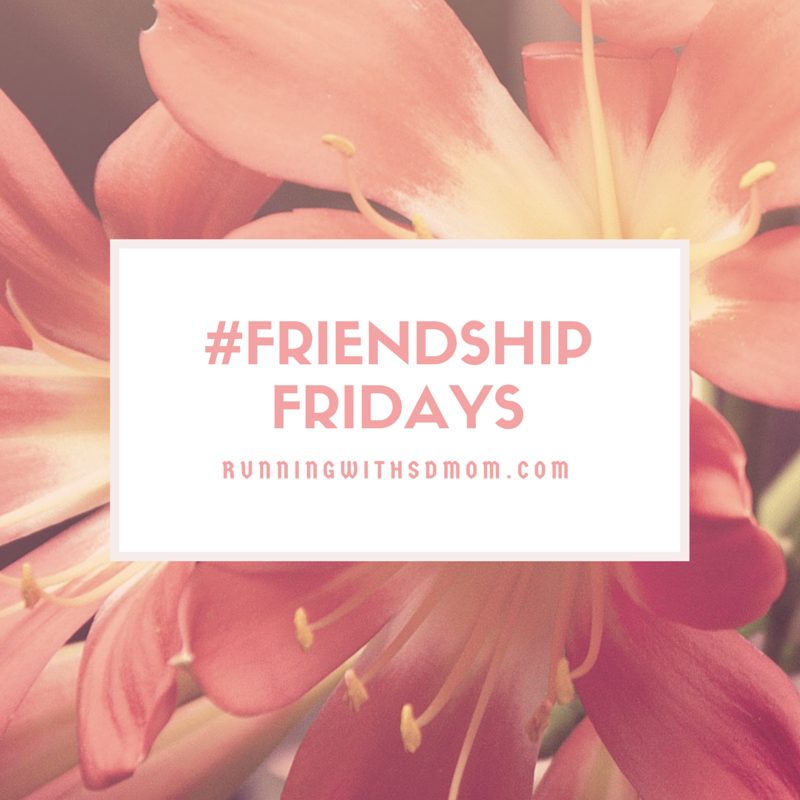 I love that you can find love and friendship anywhere! Thanks for sharing my story, Smitha. It will be 20 years together next October (and 16 years married) so running together really must keep you together. This is so cute :D Love to all! I am LOVING these features! That's a great story! Your wedding pics are the best!! Happy trails to you two! I LOVE their wedding pics too!